These cutlets are great and easy to make if you already have leftover rice, moong dal or chana dal. It is crunchy and healthy as it includes veggies of your choice. Cutlets are perfect snack for everyone. 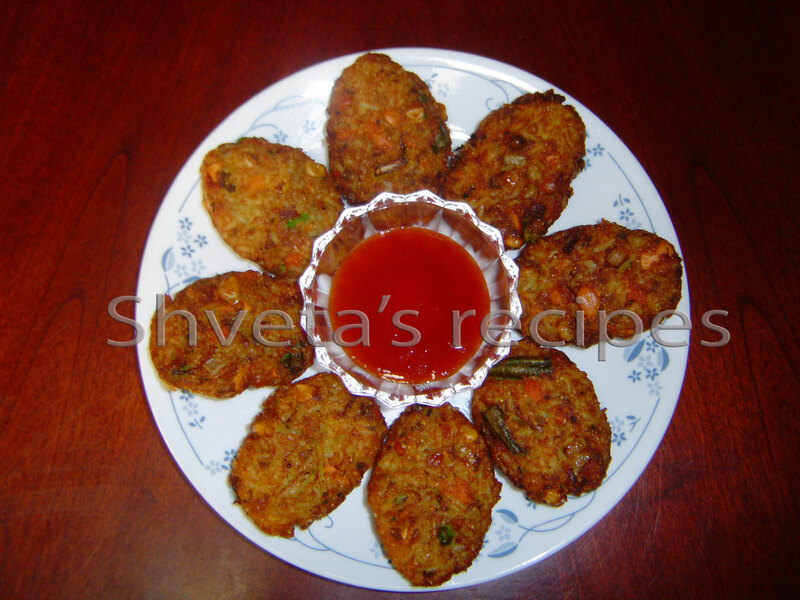 These cutlets can be used in breakfast, lunch as a burger, evening snack with tea-lemonade or as an appetizer before formal dinner. Kids love this easy to eat snack in their lunchbox too. So try this healthy and tasty snack anytime of the day. 1. Cut green beans and carrots accordingly and add corn kernels (or you can use mixed vegetables for the frozen section) in a bowl. 2. Pressure cook cut vegetables till done. 3. In a large bowl, combine cooked rice, cooked moong dal, cooked chana dal, boiled veggies, bread slice, chopped nuts and all dry ingredients and mix well. 4. Oil your palm, take lemon sized mixture and flatten it in desired shape. 5. Deep fry the cutlets using very little oil. 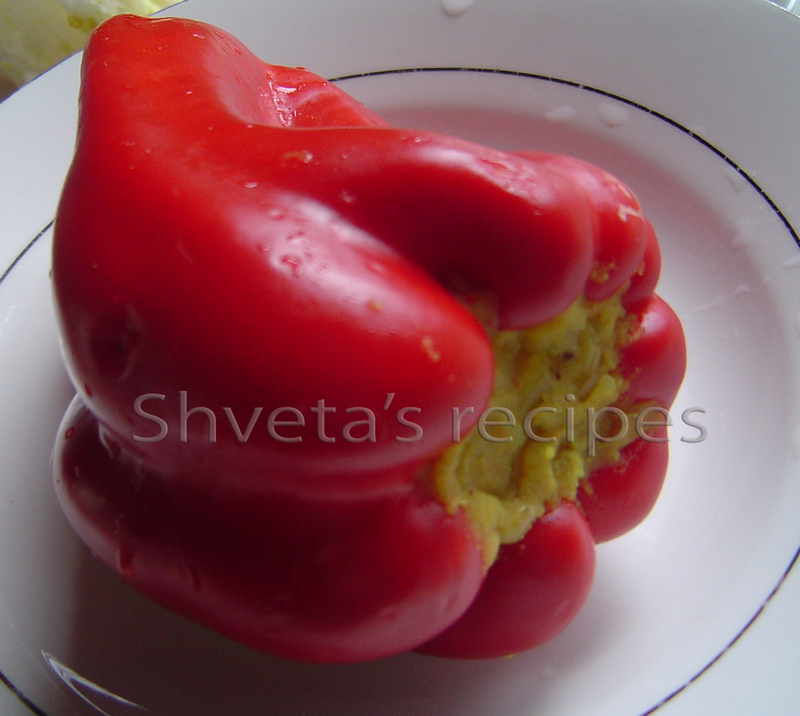 This super easy and tasty Red bell pepper recipe is not just the feast for taste buds but for the eyes too. 1. Wash fresh red bell pepper and make a hole on the stem side. Take all the seeds out of the bell pepper. Keep aside. 2. Peel and mash the potatoes. In a pan, heat 2 tbsp oil. Add cumin seeds, mustard seeds and asafoetida powder. When it crackles, add chopped onions. Sauté it for few minutes till it becomes transparent but not brown. Add mashed potatoes to it. Add all dry spices (turmeric powder, red chili powder, coriander powder, garam masala powder, amchur powder and salt). Mix well. Turn the heat off and cool it down a little bit. 3. In the red bell peppers fill the above potato filling. Bell peppers should be nice and firm. 4. 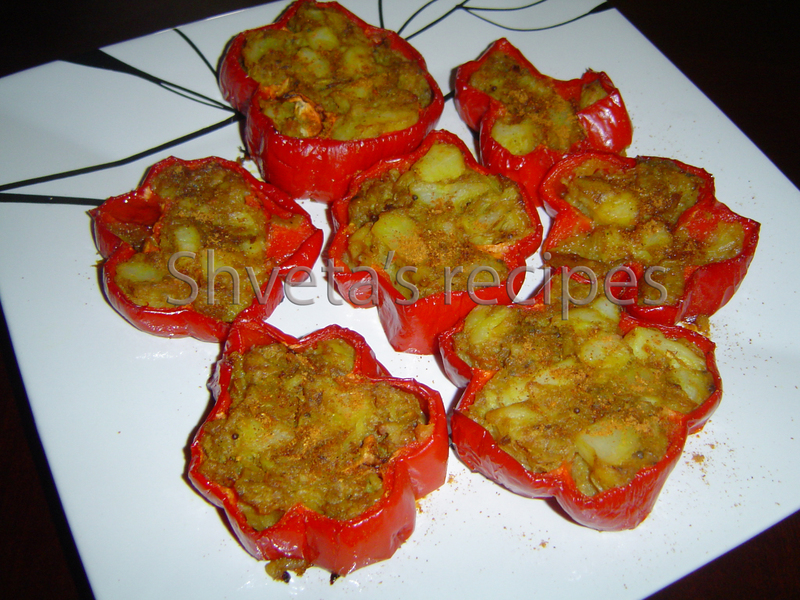 Carefully with a sharp knife, cut ¾ inch slices of the bell pepper. 5. Pre heat oven at 375 degrees. 6. On a greased baking tray arrange all the slices in single layer. Very lightly spray the slices with cooking oil. Bake the slices for 15-20 minutes. 7. Gently take the slices off the baking tray using flat turner/spatula, arrange the slices in the serving plate. 8. Sprinkle some chaat masala before serving. Easy to make and yummy in taste, is the perfect explanation for this snack. It is appetizing to even look at. Kids absolutely love it. Cut the paneer in 2*2 inch square thin slices. Keep aside. Prepare pakora batter by adding besan, salt, garam masala, red chili powder, turmeric and a pinch of baking soda in a bowl. Add water and mix well into a thick batter. 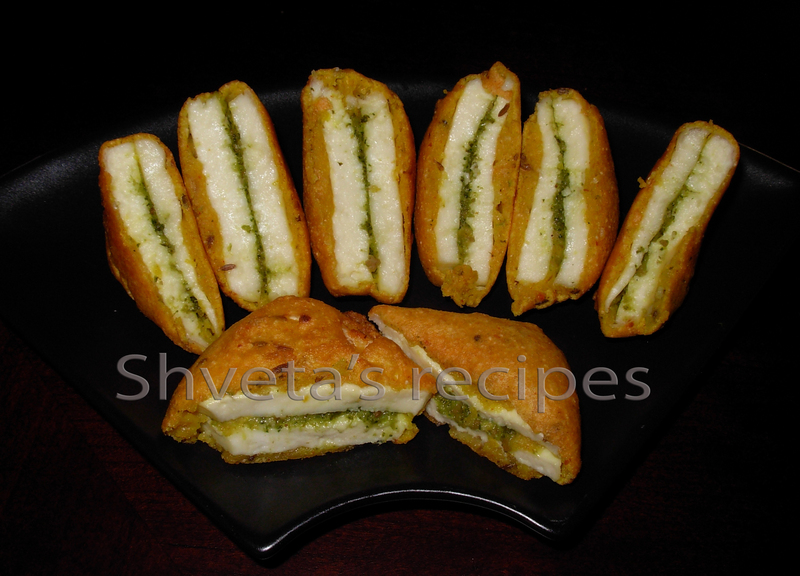 On the paneer slices, apply a layer of green chutney and cover it with another paneer slice. It will look like a sandwich. Heat cooking oil for frying the pakoras. Check the temperature, if it is medium hot. Gently cover these sandwiches in the pakora batter and fry it in the oil. Fry till it turns golden and then drain it on the kitchen towel. Sprinkle some chaat masala to the pakoras when they are still hot. After 2-3 minutes, cut the pakoras diagonally and serve hot. Serve with maggi tomato ketchup and tea on the side.